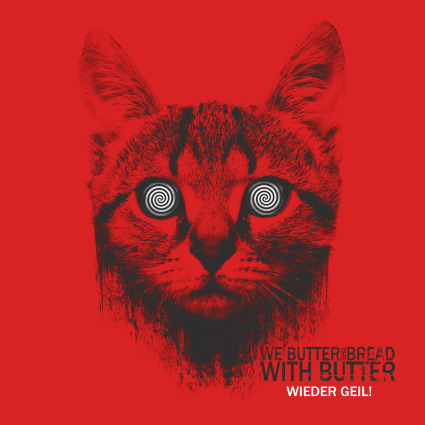 We Butter The Bread With Butter-Wieder Geil! My kids had a real hard time believing that a band like this existed. Maybe you will too. And yet it's all too true. Yes, Virginia, this is a real band. And yes, Virginia, that really is the band's name. The way I see it things would only be crazier if their name was We Butter Our Butter With Butter. Otherwise this is about as odd as it gets when it comes to (metal) band monikers. Then again this is a odd band. Or better yet, this is a odd band with a odd take on synthesized metal. Founded in 2007 by songwriter, guitarist and producer Marcel Neumann, We Butter The Bread With Butter is a German four-piece whose mission in life seems to be striking the perfect balance between synthetic sounds and samples and real instruments. Need a description? How does industrial metalcore strike you? Maybe electronic modern metal would be better tag? Or perhaps digital deathcore? Whatever the case might be, "Wieder Geil!" is the latest release from We Butter The Bread With Butter (WBTBWB) and two things are certain. And that would be A) "Wieder Geil!" has been digitally enhanced by tools of the trade in order to give it synthetic vibe and B) "Wieder Geil!" is over-the-top LOUD METAL that is closer to heavy thrash/death than hard rock. I guess you could add one other point to this album. "Wieder Geil!" might be crazy, but it's a good kind of crazy. And it's not just the actual music either as the same thing can be said of lead singer Paul Bartzsch! His crazy antics and huge vocal range help top things off all of which makes "Wieder Geil!" one of those albums where you feeling like screaming "What a rush!" at the top of your lungs! Especially when you're out and about just cruising your life away and this album is cranked up as far as it will go! Just be sure to keep one eye out for the cops while you're doing it because "Wieder Geil!" will make you want to slam it down and SPEED! So, even if this band's weird name gave me reason to pause their metal-minded music never once did. Therefore I'm giving "Wieder Geil!" my stamp of approval and until we meet again, spin this one right round baby right round!